I have no idea where the term came from, but I don’t think it’s related to the Germans (unfortunately). We’re a bit too far removed from the Pennsylvania Dutch/Deutsch for a cultural impact. Nevertheless, I suppose it’s possible. Sympathy ham only came around when there’d been a death in the family. Where others might bring casseroles or stews or things like that, the people of Wayne County brought ham. Lots and lots and lots of ham. Baked ham, smoked ham, ham sandwiches, ham soup, and yes, ham casseroles. 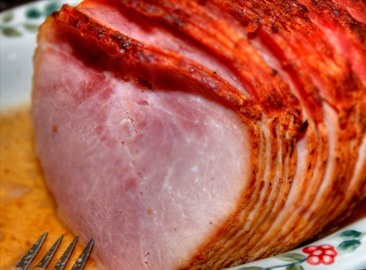 Glorious, salty ham. Wait a minute! This is supposed to be about foods for celebration, and here I am talking about death. To you, a funeral is not a cause for celebration (unless you’re one of those kinds of people), but for me, a funeral is a celebration of life. We sit and talk about our loved ones: the things we remember fondly, their quirks and idiosyncrasies, family stories they had shared, and sometimes wondering about things we’d found out just a bit too late. All the time we munch on ham: ham with mustard, ham with mayonnaise, cold ham, hot ham, ham in all its varieties. Think of it like a modern wake, but without the alcohol. Great. Now I’m stereotyping. Sorry. When my grandmother died, the ham seemed infinite. Our car seemed packed with it after church; our doorbell would ring, and there was more ham; I think someone even brought ham to the viewing. Perhaps I’m remembering that wrong. Whatever. Our refrigerators and freezers were soon maxed out with majestic ham. I think we ate ham for a month or more. I know that science and medicine claim that salt may help stave off depression and that depression is likely to kick in after the death of a loved one, but I don’t sit down and eat ham thinking “man, I’m depressed. I need more salt.” I eat it because of the memories. Because when I eat ham I’m back in Pennsylvania sitting with family talking about days done by and things I never knew, things I half remember, and things I know all too well. Ham is the catalyst for my family’s history. Without it, I would be lost. Writing 101 has challenged me. Today, we’re supposed to write in our own voice, as if we were talking to a friend over coffee. So that’s what I did. I made myself some coffee and had a friend ask me “So, what’s sympathy ham?” and typed my response as if I were verbally answering them. It might be disjointed, but that’s how most of my conversations go: I start out technical, then realize I’m being too technical, and start to dial it back. Thanks for your continued patience. This post is being published as part of Writing 101. Challenge 10: Tell about your favorite meal — the one that was always a treat, that meant “celebration,” or that comforted you and has deep roots in your memory. Tell the story in your own distinct voice.